Kioti Tractor expanded its DK10 product line with the introduction of eight new compact tractor models in the DK10SE Series, available across North America. The DK10SE series includes four cab models—the DK4210SE HC, DK4710SE HC, DK5310SE HC and DK6010SE HC—and four rollover protection system (ROPS) models—the DK4210SE HST, DK4710SE HST, DK5310SE HST and DK6010SE HST. Engine gross hp for the new models ranges from 40 to 58, and power takeoff (PTO) hp ranges from 29 to 45. All models come standard with rear differential lock, rear PTO, hydraulic power steering, 4WD, a remote hydraulic valve and an onboard toolbox. Each DK10SE Series tractor is powered by a liquid-cooled, fuel-efficient, three-cylinder Daedong diesel engine. With a rear external three-point control lever and hydraulic independent PTO, the DK10SEs can deliver power to a variety of implements, which can be connected via a three-point hitch. The DK10SEs also offer easy access to the fuel filter, oil filter, coolant reservoir, dipstick and fuel tank, and the tilt steering wheel and adjustable seat allow operators to settle in for a comfortable ride. Cab models feature heat and AC, rear window defrost, a single lever joystick, front work lights and a power socket with USB connection and an AUX port. DK10SE ROPS models feature an open platform design with a deck mat and fender grips on each side for easy mounting and dismounting. Additionally, the introduction of the DK10SE Series brings about two newly developed loaders—the KL5520and KL5521—for ROPS and Cab models, respectively. These front-end loaders can be easily attached and detached with the assistance of a built-in parking stand. The Kioti KB2485 backhoe is also compatible with the DK10SE Series. 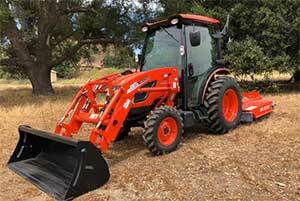 Expert Tips: To buy, lease or rent compact tractors/compact wheel loaders?